I made a return trip to Glenmuick to ascend The Stuic, which I missed on my last visit due to very poor visibility. No such problems this time with beautiful sunny conditions. 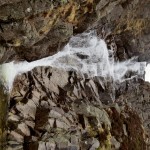 I cycled to the Glas Allt along the loch and climbed from there, cutting through the last valley to the west to emerge at the corrie, leaving a gentle climb to the summit. I returned the same way, after a leisurely lunch admiring the views. I saw greylag geese, pied wagtail, chaffinch. goldcrest, red grouse, ptarmigan and raven. This entry was posted in cp36 and tagged Phil on September 27, 2015 by site_admin. From Glenmuick carpark, up to Caisteal na Caillich via the usual track up to Lochnagar. Then down and across the grassy bog around the north shouder of Meikle Pap to approach Lochnagar Loch from the north side. Very strong wind gusting down the cliffs and across the Loch, so went around the north shoulder and saddle to approach Lochnagar top up its NW shoulder. Brief stop on Lochnagar, very low visibility as cloud down over the tops. Then off to the Stuic – will have to come back when there’s good visibility. Then followed track west until the first burn, and followed that down to Dubh Loch. All reasonable running on descending ground. Followed track down from Dubh Loch for half k, then struck out up to Loch Buidhe and then across the flat mossy ground to the track down to Glasallt waterfall. The return back along the loch was quite an effort. 32Km walking/jogging, 6 hours moving time. Fab scenery. This entry was posted in cp100, cp36, cp37, cp39, cp40 and tagged Warren on September 18, 2015 by site_admin. 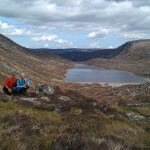 Started out up the Lochnagar path to the Meikle Pap saddle and dropped down into Lochnagar (loch). 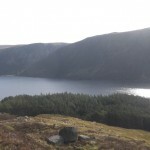 It had been suggested by a couple of helpful walkers, that we could come back out by climbing the ridge to the west of the loch. We had a look but we aren’t entirely happy on these steep slopes and my gammy arm clinched it – we would come back out towards the saddle. We were now looking at combining routes posted by SaraD and DaveH (in reverse). Along the good path to The Stuic (cp36) and then over Carn a’ Choire Bhoideach and heading down into the Dubh Loch (cp37). 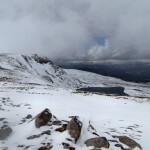 It was a long, rough climb down and chapeau to SaraD who climbed up from the Dubh, and in snow! From here we reversed DaveH route over past Loch Buidhe before getting onto the tourist route down to Glasallt waterfall(cp39). Eventually got down to the lochside track and the long walk back. A big day out and two weary Deeside Runners ended up at Aboyne for fish an chips. This entry was posted in cp100, cp36, cp37, cp39 and tagged D&E on June 9, 2015 by site_admin. Arrived at Loch Muick car park in a whiteout and -0.5C. Sat in the car for a few minutes deciding what to do, by which time it started to brighten up and plan A was on the cards again. Cycled round the loch to the block of trees at the foot of the Glas Allt, then headed on foot up towards the Dubh Loch (cp37). From there carried on up the glen beyond the big crags before striking north up the hill towards Carn a Choir Bhoidheach. Into the snow by this stage which was difficult – very variable in depth and mostly quite soft. Disappeared down a few holes before getting firmer footing as I climbed higher. Quite a few mountain hare and ptarmigan on this side of the hill, and also what I think was a dotterel (didn’t get quite close enough but shape and size were right). Now into the cloud and glad that I’d thrown a compass in at the last minute. 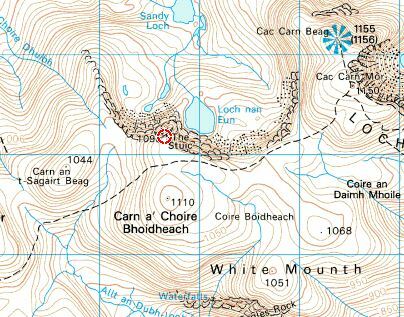 Found the summit of Bhoidheach and from there took a careful bearing to the Stuic (cp36). Thankfully found it before the nearby dodgy looking cornice. 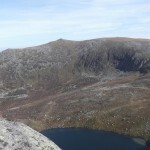 Then it was across the plateau (at a sensible distance from the edge) to contour below Lochnagar to the Glas Allt track. Snow was quite deep across here making for slow going, then I lost my right leg through a snow bridge over the source of the Glas Allt, jarring my left knee into my chest. More hard going before meeting the Glas Allt track and an easier run back off the hill. Stopped for the photo at the foot of the falls (cp39), then back to the bike. Glad to see it by this stage. This entry was posted in cp36, cp37, cp39 and tagged SarahD on May 1, 2015 by site_admin. 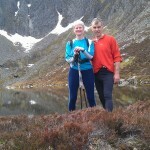 A fine day Around Lochnagar. Sunday on Stob Coir’an Albannaich was enough to make me stop winter activity in the highlands. A 10 degree temperature inversion, ran and strong head winds meant hard work to no climbs and no views. Where as today will be one I will rememberfor all the right reasons. 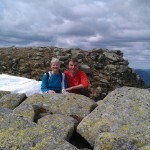 For a start Daves hill challanges got me to visit Lochnagar using ways I have never done before. Hard snow made walking easy and I have never seen and heard so many birds on a day in the hills.The hares seemed happy to have me as company and virtually no pathways in the snow. Caisteal na Caillich provides a varied view of the cliff, and I was surprised by the weather station just beyond Lochnagar, as in the loch, not the cliff. Tiredness nearly had me heading down but the ticker one and Central Buttress (II) was a pleasure with a tricky step near the top to get the adrenilin running. The Stuic was a pleasant stroll westwards to fine views. The return shortly joined the tracks which led to the Falls of Glassalt and the path down in evening sunshine. Thouroughly recommended as a day out. This entry was posted in cp100, cp36, cp39, cp40 and tagged Duncan on February 10, 2015 by site_admin.